Routine veterinary care is a crucial part of animal ownership, but it isn’t just for domestic pets. As a responsible and caring equine owner, it is just as imperative that you have found a qualified, experienced and competent veterinarian available to perform regular checks on your horse, and to be on standby in case of any sort of illness, accident or emergency. Choosing the right veterinarian is one of the most important tasks that you will undertake. After all, when your animal is unwell and needing treatment, you need to ensure that he is in hands that you can trust to give him the care that he needs. Here are our top tips for how to choose a great equine veterinarian. The best way to find a competent veterinarian is to ask around for a personal recommendation. Your trainer, farrier or other fellow horse owners are the first people that you should ask, as they will have undoubtedly have had some dealings with equine veterinarians in the area. Even if they aren’t able to make a specific recommendation, they may be able to tell you which vets they dislike and why. While many vets can treat a range of different animals, equine medicine is a particularly complex field. Therefore, if you have a veterinarian locally that specializes in equine care and meets your other requirements, they may be able to provide a better level of care than a mixed-animal veterinary office. Getting a horse to the vet, especially in the case of a medical emergency, is a lot trickier than transporting a domestic pet. 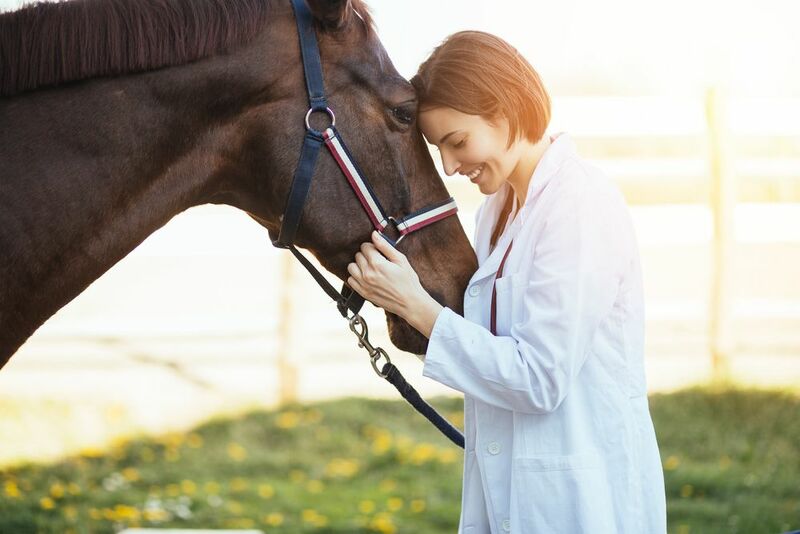 As such, location should be a key consideration when it comes to choosing your equine veterinarian, in addition to their availability to provide house calls. Once you have narrowed down your list of potential vets, the next thing you should consider is what qualifications, training and experience they have. A good vet will be able to tell you how long they have been practising, what additional training they may have received and how they have handled particularly tough cases. Horses teeth grow extremely fast and will require regular maintenance to keep them healthy. A good equine vet will have dental qualifications and have the tools needed to provide quality dental care for your horse. This includes having access to an x-ray machine, and keeping permanent dental records to keep track of the condition of your horses’ teeth. Bedside manner is an important part of any sort of medical treatment, as you are placing the wellbeing of your family – whether human or animal – in the hands of someone else. When you look at prospective vets, try and find one whose personality fits with your own. Do you want someone light-hearted and humorous? Or would you prefer a vet who is more serious and focused? Above all else, trust your gut instinct. If it is telling you that a vet isn’t for you then walk away. Equine veterinary care is an expensive business, but that doesn’t mean you should choose the cheapest one possible, or you should choose one who you love but will cripple yourself financially to pay for. Ask potential vets for an idea what their fees are for the services you are likely to need, and if payment is due upfront or if there offer payment plans for more expensive treatments. Contact Parkside Animal Hospital for details. Here are some pet accessories that you may want to consider to keep your pet comfortable this winter. Read about Equine Dentistry and its benefits at Parkside Animal Hospital in Rocklin, CA. Learn more about the tips and guidelines on how to choose the perfect veterinarian for your equine. Contact us at 916-824-2644 for details. Whether you race your equine or simply ride for pleasure, chiropractic care can be extremely beneficial for your horse, helping him to live a full, functional and healthy life. Find out more about seizures in dogs and cats and what you can do to handle them safely and effectively to get the best outcome for your pet. Call 916-824-2644 for urgent care. Owning a puppy is often likened to having a newborn baby, and it is easy to see why. Requiring a lot of time and attention, puppies can be a demanding pet. Learn more about puppies today.